Fale tudo em ingles | Blog que ajuda a melhora seu inglês! As you listen to the dialogue watch out for the words and expressions presented below. Ex. “I’m all set. Let’s go!”, said Tony to a friend. Ex. Many people were invited for the grand opening of the new store. Ex. The marketing team worked around the clock to finish the project on time. Ex. “So, is everything running smoothly at the plant?”, Mr. Barns asked the plant manager. Ex. “I hope all this hard work pays off eventually!”, said Greg to a coworker. Ex. “Thanks to our rapid expansion across the country our company has been offering many jobs in several departments,” explained Mr. Jones at the meeting. Ex.There are good business opportunities in the franchise world. Ex. “It sounds like a profitable investment. Tell me more about it,” said Ray to a friend. Ex. “Do you know if that company is looking for franchisees in other areas of the country?”, Neil asked a colleague. Ex. Mick: It sure takes a lot of physical exercise to be in good shape. Howard: I know! No pain, no gain, right? Referência: Fale tudo em Inglês nos Negócios! José Roberto A. Igreja – Disal Editora Clique aqui para conhecer este livro. 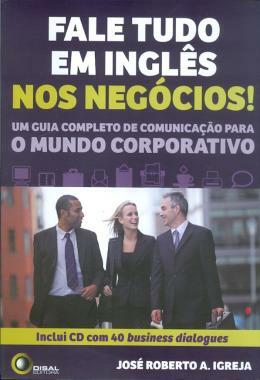 Referência: “English for Job Interviews” – José Roberto A. Igreja e Robert C. Young Disal Editora. Clique aqui para conhecer este livro. Interviewer: You’ve been working in maintenance as a coordinator I see. What have you liked about the job? Interviewee: I like the challenges the most. I work with the director to come up with ways to motivate and use the machines to their best capacity. Interviewer: Have you had any big challenges at your last job that can display your leadership and communication skills? Interviewee: My director created a new program for saving energy. For these changes to happen, I would have to train the staff to learn how to observe any energy loss the machines might have and how to be autonomous with their job. Interviewer: Can you expand regarding your staff being autonomous please?Interviewee: What my director and I decided to do was to train each machine operator to learn how to repair any problems that might happen to their machine. We also gave them new guidelines on how to better preserve energy. This was important because if the workers could repair their own machines, it would save a lot of time for me and my director. Interviewer: Can you tell me how you handled an emergency situation, if you had one before. If not, how did you prepare for a possible crisis? Interviewee: My director and I were given strict guidelines from our corporate headquarters on what do to. It was our job to train our staff. We would have emergency drills every two months. We also had monthly checks on the machines to make sure they were running properly. Interviewer: Have you ever had to settle a conflict between two workers? Interviewee: Never a strong conflict. But I have had disagreements and arguments that have happened. I believe in open communication and my door is always open. I would bring in one at a time to get their story and then both together after talking to them privately. I believe in listening and being empathetic. It always worked. Interviewer: Manufacturing can be quite repetitive and stressful. Did you have any methods to help ease this with your staff? Interviewee: Yes. I had a room that was called the “time-out room”. This was where they could play cards, music or relax on a sofa during their break. They seemed to like this because it showed that we cared enough about them. Interviewer: I see. The “time-out room” seems to be also a good place for employees complaining of repetitive strain injury! Interviewer: And what are your strengths in your opinion? Interviewee: I am a strong communicator and motivator. I expect a lot from my workers, but I give a lot back as a leader. I am quite organized and have a systematic way of keeping track of overhead and maintenance problems. Come up with ways: think of ways; find ways. To display/displayed/displayed: to clearly show an attitude or quality by what you do or say. Staff: a group of people who work for an organization, or for a manager in an organization. Strict guidelines: severe policy or conduct. Emergency drill: an occasion when people practice what they should do in a dangerous situation; exercise; practice. Running properly: working in an adequate or appropriate manner. Settle a conflict: bring a conflict to an end. Arguments (pl. )/argument (sing. ): a situation in which two or more people disagree, often angrily; controversy; dispute. Empathetic: able to understand other people’s feelings and problems. To ease/eased/eased: to relieve from distress; to lessen the tension of; to make easier. Keeping track of overhead: maintaining a record of general business expenses. “That guy is freaking weird! I’d stay away from him if I were you,” Bob advised a friend. “Aquele cara é muito estranho! Eu manteria distância dele se fosse você”, Bob aconselhou um amigo. “Tom thinks he’s so freaking smart, but honestly I think he’s a bit of a retard,” said Larry to his friends. “O Tom se acha tão esperto, mas sinceramente eu acho ele meio retardado”, disse Larry para os amigos. Seems like you’re a real fitness freak! Mick: Hi Sheila, I haven’t seen you in a long time. How’ve you been? Sheila: Pretty good! Hey, you look like you’re in great shape. Have you been pumping iron? Mick: As a mater of fact I’m just coming from the gym. I had an amazing workout session under the supervision of my personal trainer and I must say, I feel like a million bucks! Sheila: My congrats! You do look well-toned! What do you do to keep fit? Mick: A little of everything I guess. Push-ups, sit-ups, you name it. I also run on the treadmill for about twenty minutes after every workout session. Sheila: Wow, seems like you’re a real fitness freak, aren’t you? How often do you go to the gym? Mick: I try to go every day, but you know, sometimes I’m too busy and I can’t make it. I do miss it though. What about you? Don’t you work out at all? Sheila: No, not really. I know I should. I’m starting to put on a little weight and I think doing some physical exercise would really do me good. Mick: Sure Sheila, you will feel a lot healthier once you start working out regularly. You can take my word for it! Well, I gotta take off now, I’m late for work. Sheila: Thanks for the tip Mick! You might see me at the gym sometime soon! Mick: That’d be great! See you around, take care! José Roberto A. Igreja, Disal Editora. I – Fill in the blanks in the dialogue below with a word or expression from the box and then listen to the dialogue to check your answers. Dave: What´re you talking about? Ryan: I got tickets for the (2) _______________ on Saturday. Dave: You´re (3) _______________, right? Tickets have long been (4) ___________ at the(5) _______________. Ryan: You´re right! I bought them from a (6) _______________. Dave: Wow, you must´ve (7) _______________for those tickets. Ryan: Yeah, they nearly (8) _______________, but I think we deserve it. Ryan: So, how many did you get? Dave: Four. That´s all that he had left. I can´t wait to tell Jeff and Bill. Ryan: Man, they´re (9) _______________ (10) _______________when they hear it. Listen, why don´t we all go to our favorite (11) _______________ and have (12) ____________ beers to celebrate? Dave: Sounds like a great idea! I´ll call Jeff and tell him the good news. The new gadget – A paradigm shift! Roger: I have the feeling we´re on to something big. This new digital watch combines some of the best features available today. I´m sure it will be a hit with the young crowd. Brian: You can say that again! I´m really excited about the prospects. I´m sure this new gadget will appeal to a large number of people. Besides its state-of-the-art technology it´s got a great design to it. Roger: Sure! Do you think we´ll have it ready to be launched at the next tech fair?Brian: I´m not sure, I think it might take a while before we have a final version up and running. The next fair is coming up soon and the clock is ticking you know. I´d really rather not rush it, you know the saying, haste makes waste! Roger: Right! I guess you have a point there Brian. Ok, let´s schedule a meeting with the tech team and find out what would be a feasible timeline for this new product. I can´t wait to see it hitting the shelves of stores across the country. I think we´ll be sending a new message to the market. Brian: Really? What would that message be? Brian: Wow Roger, I think you nailed it! That´s right. A paradigm shift! It feels great to work for a company at the cutting-edge of digital technology like ours. Roger: It sure does pal! Dialogue comprehension – True, False or I don´t know? The first time I read the phrase in bold below was some twenty odd years ago. I was teaching English in a company in São Paulo and the framed picture hanging on my student´s office wall had caught my eye. 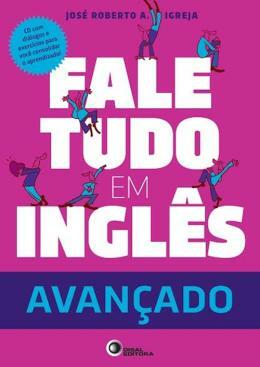 It made perfect sense to me, and indeed I used it when I wrote my very first Business English book, Fale Tudo em Inglês nos Negócios, back in 2011. 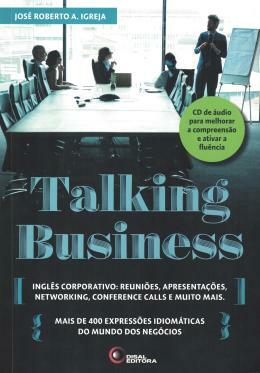 Since then there have been others, Fluent Business English, a book I co-wrote with Robert C. Young in 2012; Fale Tudo em Inglês nos Negócios – Livro de Atividades (2013) and now, “just fresh out of the oven”, my most recent brainchild: Talking Business. Like all my previous Business English books, Talking Business portrays the corporate lingo you are likely to hear in companies across the U.S.A. The 20 units of the book cover in a comprehensive way the most usual business idioms used by American executives, which are introduced in a lively fashion through articulate corporate dialogues. With sections such as “usual phrases and questions in the business world” and “corporate acronyms and abbreviations” the book also provides plenty of practice and includes an audio CD with dialogues and exercises recorded by native speakers of English. Check out below for some of the topics and dialogues featured in this new book. A new supplier – I googled them and guess what I found out? The board meeting – Have you been eavesdropping on them? Technology – Heading towards another big revolution yet! Trade shows – Is everything all set for the Houston fair? A dream job – What is it like? Corporate scandal – How could a respectful and clever executive get into this? Hopefully all the carefully selected business jargon and varied activities present in Talking Business will help students move up the corporate ladder. Watch out for slips, trips and falls! Terry: So, what are you doing tonight? Phil: I plan to go skating at the local park. They have a real nice rink there, very smooth. Terry: Cool! I’ve never been into skating myself, but I have some friends who love it. Watch out for slips, trips and falls! Phil: Oh don’t worry, I’m always extra careful when I have my skates on. By the way, I’m teaching my twelve-year-old nephew how to skate. It’s amazing how kids pick things up so quickly. He’s just been to the rink twice and he’s already getting the hang of it. Terry: I know, kids are fast learners my friend! So, you’re into winter sports, right? Phil: Oh, yeah! Besides skating I love to go skiing and snowboarding. Terry: Skiing and snowboarding? Wow, I think I’d be afraid to do that. I guess it must be really difficult to keep your balance. Phil: Well, it takes a lot of practicing and you do have to overcome your fear, but once you learn how to do it it’s a lot of fun. Terry: I see, I prefer to have both my feet on the ground, if you know what I mean. Anyway I hope you enjoy yourself tonight at the rink. Phil: I will, thanks! How about you? Are you doing anything tonight? Terry: Yeah, I’m meeting some friends at a pub. I love to hang out with friends and shoot the breeze over beer. Phil: Sounds good! Have fun! 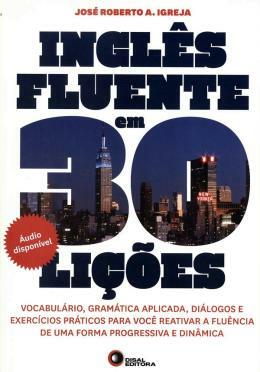 Referência: “Inglês Fluente em 30 Lições” – José Roberto A. Igreja, Disal Editora. 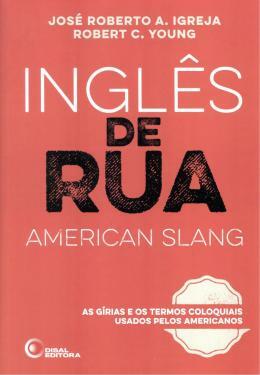 Clique aqui para conhecer este livro. Ecofriendly products are here to stay! Derek: How’s your new 1 ecofriendly business coming along? Miles: Great! We’re really excited about our product line. I mean, it’s a whole new concept and we do believe this market tends to grow as people become increasingly more conscious about the environment. Derek: Sounds good! How many different products do you have available for sale right now? Miles: We have a wide 2 range of products, from 3 biodegradable detergent to ecofriendly 4 diapers, but our eco shopping bags are our best-selling products right now. Derek: So are these bags recyclable? Miles: Sure, they come in three different sizes and are made of non-toxic material which is easy to decompose. They do help keep a more sustainable environment and that’s something we should all be worried about. Derek: Wow, it seems like ecofriendly products are here to stay! Miles: That’s definitely the new trend my friend, but don’t get me wrong, like in any business, in order to be successful you have to combine quality and convenience with 5 affordable prices. Derek: I know, I tend to be very 6 picky as a consumer myself. Well, I’m really glad for you Miles. You’re setting a good example. I guess we can all do something to help our planet! Ecofriendly goods and services tend to grow as people become more conscious about the need to protect the environment. “Their new range of beauty products is very appealing,” said Joey to a colleague. “That company sure worries about the environment. All their packaging is made of biodegradable material,” said Dennis to his coworkers. “Frank can’t come to the phone right now. He’s changing the baby’s diaper,” said Rita. “Do you know a good place where we can buy eletronics at affordable prices?”, Malcom asked a friend. When it comes to food Rachel is really picky. Referência: “Fale Tudo em Inglês nos Negócios!” – José Roberto A. Igreja, Disal Editora. Clique aqui para conhecer este livro.